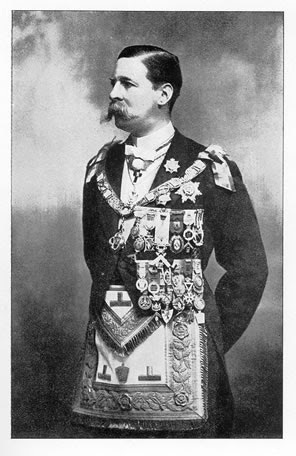 The Midnight Freemasons: Ribbons and Medals and Caps . . . Oh My! The lifeguard made Larry stand well back from the edge of the swimming pool--for obvious reasons. Masonry has a long history of awarding its more industrious members with all manner of recognition for exceptional service, and dedication, and accomplishment. There are ribbons, and medals, and caps, and pins, and certificates, and tie tacks and . . . well, you name it, and we've got it. There is nothing more humbling than to receive recognition from your Brothers for something you've done well. And even more satisfying than that is being in the position, like the Master of a Lodge, to recognize and reward somebody else for their dedicated service. I enjoyed several opportunities to do just that when I served in the East. But a few Freemasons (not many, but a few) miss the entire point of the Craft. Their goal becomes collecting ribbons, medals, caps, titles, and jewels. What they fail to understand is that those things are rewards for doing what is truly important--serving! If the only reason you're doing a thing is because you have an expectation of being rewarded, then you are doing it for the wrong reason. It's not the cap, or the medal, or the title that you wear on the outside that makes you a better man--it is what is on the inside that matters. Fortunately, those misguided Masons are few and far between--most Freemasons get it. They don't work as hard as they do for rewards, they do the work because they believe what they are doing is important and it matters to them. They learn ritual. They serve as mentors. They volunteer. They teach. They train. They inspire others. They know when to step forward and help, and when to step back and let a new Mason try something for the first time. They travel to the funerals of Masons they didn't know well, or didn't know at all because that's what we do. And on the rare occasion those dedicated Freemasons are recognized for the work they've done, they are truly astonished. They feel odd about being rewarded for something it has been their absolute privilege and pleasure to do. And no matter how long and how hard they have worked, most feel they don't deserve the honor--they'll think somebody else is more deserving than they are. Somebody else had worked harder, or longer, or accomplished more. And do you know what that means when they feel that way upon being rewarded? It means they do deserve the recognition because they weren't doing it for selfish reasons. I have a very nice Past Master's apron that my wife bought me after I left the East. I wear it humbly, because even though my wife paid for it, the opportunity to serve in that capacity was a gift given to me by the Brethren of my Lodge. Five years after I was raised a Master Mason in that Lodge, the Brethren of that same Lodge entrusted me to serve them as their Worshipful Master. And during the time I spent in the East, not one single thing did I accomplish alone--but together we (my Brothers and I) accomplished much. I hope one day to have the privilege to sit in the East again, because it's not wearing the fancy Past Master apron that matters the most to me--it was the opportunity to serve my Lodge to the best of my ability.